the CFDA is “disappointed” in MObama? CFDA believes in promoting American fashion. 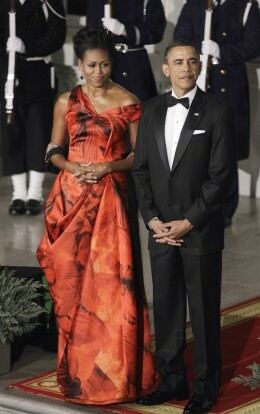 Our First Lady Michelle Obama has been wonderful at promoting our designers, so we were surprised and a little disappointed not to be represented for this major state dinner. COME ON. I don’t actually know if it is possible for the people in our oft-ridiculous industry to take themselves a bit more seriously. It’s a dress! And a RIDICULOUSLY gorgeous one at that! We should be giving props to our First Lady for taking such a bright, red, beautiful risk. Sure, it would have been nice if she had worn an American designer (as she almost always does otherwise), or even a Chinese one (Vera, anyone? ), but she didn’t, so move on, people! AMEN sister! it is a wonderful dress and the color was extremely appropriate for the occasion… how quickly american designers take offense to such a decision instead of seeing it as a beautiful gesture to honor a recently departed talent!